Last month we partnered with an organization called For Kids to help them in their cause. Their mission is to break the cycle of homelessness and poverty for families and children. After members of the Holy Trinity Catholic Church found that the same families coming to their food pantry were sleeping on the local beaches, they knew they needed to do more. By partnering with 12 other churches in Ocean View, they were able to found Homeless Haven 30 years ago in 1988. This led to Haven House which provided an emergency shelter facility which will serve the homeless. 200 people use this facility every year. From here, ForKids was born and serves 47,500 lives annually in Virginia. They strive to treat the root of the homelessness for each family with holistic housing programs and extended services each year. 92% of the families in their program exited to appropriate housing last year! 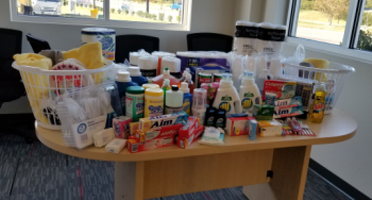 We jumped at the chance to help such an amazing organization and we are proud to announce we were able to gather so many household supplies for their efforts! Thank you to everyone that helped us donate so much and a huge thank you to ForKids for all that you do!